Work is a real Monster! Jump into the lives of the workers for the world's biggest multinational Kaiju-conglomerates! Rebuilding the world following giant monster attacks takes a Kaiju-sized work-force. Do you have what it takes to face the hazards of mayhem, destruction, biohazardous waste, human resources, minimal career prospects, and really really big footprints? 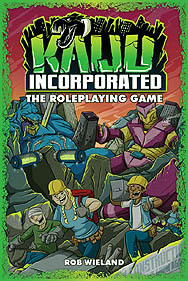 Find out in Kiaju Incorporated: The Roleplaying Game.